Scholars believe the modern game evolved from a similar game played as far back as 1400 B.C.E. called Alquerque or Quirkat. It was played in ancient Egypt, Rome, Greece and India. The game used two sets of round flat pieces in different colors. It was played on a 5 x 5 grid. There were ten pieces per side, and the object was to capture all the opposing pieces. 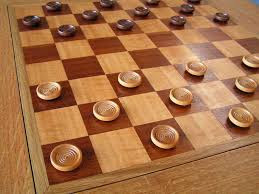 The next development towards modern checkers is thought to have come from 13th century southern France. The rules and pieces of Alquerque were expanded to be played on an 8 x 8 chess board. The game was called Fierges, the pieces called ferses, the identical name given to the queen in chess. By the 15th century, the earlier association with the queen in chess saw the name of the game changed to Jeu De Dames, most often shortened to Dames. By the 16th century, Dames was very popular in France. Variants of the game were many, and one of these was the 'forced capture' variant, where a player had to capture an opponents piece instead of making a different move. This variant became known as Jeu Force. The game of Jeu Force was taken to England where it was called draughts, and finally to North America where it was called checkers. In France the game of Dames without the forced capture rule was still popular and called Le Jeu Plaisant De Dames, shortened to Plaisant. In the 18th century, the game in France changed to a 10 x 10 grid and 20 pieces on each side. This game is still played and is known as International or Continental Draughts. The USA currently dominates the game of checkers. But many of the strongest players are in their 60's and 70's. England seems to be coming on strong, with some younger players. There are international tournaments for both Checkers/Draughts and International Draughts. The first tournament for English Draughts occurred in 1847. There are many variants of the game around the world today, but Chinese Checkers is not one of them. The game has nothing to do with China, but originated in Germany. The game was put on the market in the early 1900's and was called Chinese Checkers to capitalize on people' familiarity with checkers and to give the game an oriental flavor, as marketing ploys. Marion Tinsley, PhD, who died in 1995, was widely considered the greatest checker player in history. Over a 67-year period, in tournaments and individual matches, he lost only 22 games, many of those while still nearly a teenager.